It’s time I ’fessed up. My name is Pam, and I have a problem. No, not what you think (though I do like wine). It’s about my obsession with wool. I collect recycled wool sweaters and blankets — lots of them, from eBay to local thrift shops, wherever I can find them. Once they're collected, I tumble them in the washer, dry them in the dryer, and end up with piles and piles of clean, felted wool. They’re lovingly folded and placed in storage boxes which are now, I swear, multiplying and filling the basement and attic and threatening to take over our normal living spaces. So it was perfect that I had the opportunity to go to author Crispina ffrench’s workshop on making blankets from recycled sweaters. My goal with the workshop was to make two baby blankets for the twins my son and daughter-in-law are expecting. I had the idea that I would try to follow a color palette that I’d created with watercolors and hope that it would ultimately somehow resemble the landscape of the Berkshire Hills where we live. And as I think we’re going to discover with the twins, once I did that with the first blanket, I did the same thing a second time using the same size and number of rectangles for the second blanket. 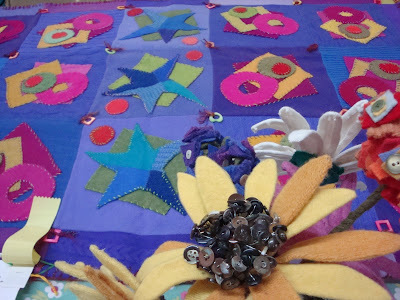 And then I sewed all the rectangles together for each blanket, using a wide zigzag stitch. Then, in an absolute display of magic, Crispina showed how to go from basically two blankets with no landscape features, just rectangles, to two blankets of curving hills and mountains. 1. Place the blankets one on top of the other . 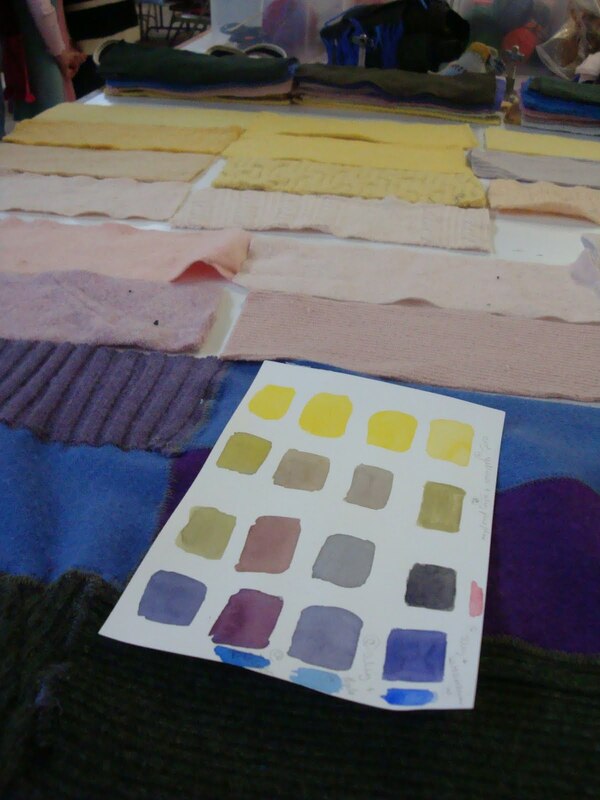 . . match them up as exactly as two blankets made from different recycled sweaters can match up. 2. Cut through both blankets at once with scissors, making the shapes of the hills and mountains. Do this horizontally across both blankets, all the way across, at two or three different places. More if you dare. I’m sorry I don’t have pictures of this. It was so scary that I forgot to get my camera out. I had already spent hours making two complete blankets. Now I was cutting through them, cutting across the very same stitches I just put in. I was sure the whole thing would be ruined. Here’s how they turned out. Somehow I love that these two blankets, like the twins, are mixed and matched from two different blankets and end up being their own unique creation. The clouds were added last, by making a cloud pattern out of paper, then cutting cloud shapes out of a white recycled sweater. Cut the exact same shape (using the pattern again) out of the blankets (still frightening) and replace that piece with the white clouds. I made my clouds different for the two blankets because, though I haven’t met them yet, I know those little twins will need to have their own individual clouds. If you want to learn more or have a houseful of hoarded sweaters, here’s help on the way! Glad I got to see these! Thanks for posting pics. Greetings Pam, I enjoyed your review of a Crispina workshop. 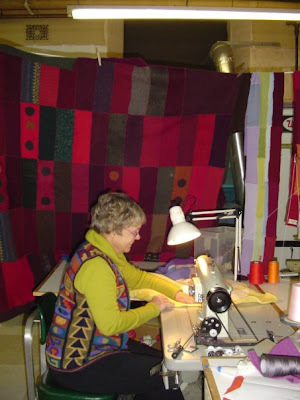 I have enjoyed her sweater workshops and now am temped to join a blanket workshop shop. Thanks for the posting. Love your blankets, particularly the watercolor connection.